The revelations that Obama administration secretly collected phone records and accessed the internet activity of millions of Americans have raised new questions about the public’s willingness to sacrifice civil liberties in the interests of national security. Since 9/11, Americans generally have valued protection from terrorism over civil liberties, yet they also have expressed concerns over government overreach and intrusions on their personal privacy. But Fewer See Need to Sacrifice Civil Liberties. Yet fewer Americans think it will be necessary to sacrifice civil liberties to combat terrorism than did so shortly after the 9/11 attacks. 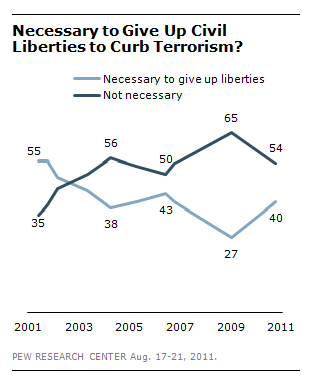 In a poll conducted in 2011, shortly before the 10th anniversary of 9/11, 40% said that “in order to curb terrorism in this country it will be necessary for the average person to give up some civil liberties,” while 54% said it would not. A decade earlier, in the aftermath of 9/11 and before the passage of the Patriot Act, opinion was nearly the reverse (55% necessary, 35% not necessary). Track Terrorists – Not Me. The public has never liked the idea of the government monitoring their personal phone calls or emails. In the 9/11 anniversary survey, just 29% favored “the U.S. government monitoring personal telephone calls and emails” in order to curb terrorism. It drew less support than the other anti-terror tactics asked about in the survey. Bush’s Domestic Surveillance Program. In late 2005, news that President George W. Bush authorized the National Security Agency to monitor phone calls and emails –without court permission – stirred intense civil liberties concerns, especially among Democrats. From early 2006 through early 2009, public support for the program ranged from 48% to 54%. The question asked if it was generally right or wrong “for the government to monitor telephone and e-mail communications of Americans suspected of having terrorist ties without first obtaining permission from the courts.” There were consistently wide partisan differences on views of this program: in February 2008, nearly twice as many Republicans (74%) as Democrats (39%) favored the phone and email monitoring. What is often overlooked in the debate over government surveillance of private communications is the widespread public concern over the amount of personal information businesses are collecting. In our 2012 political values survey, 64% said they were concerned that “the government is collecting too much information about people like me.” Yet 74% expressed this concern about business corporations. Concern that business corporations are collecting too much personal information crosses party lines. In addition, Republicans have become much more concerned about possible privacy intrusions by the government than they were during Bush’s presidency (72% in 2012, 39% in 2007). Carroll Doherty is director of political research at Pew Research Center.